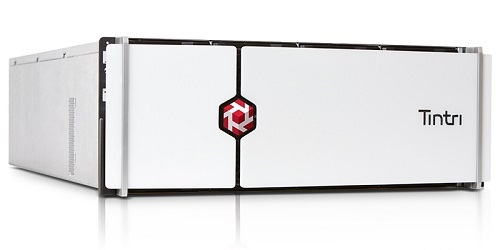 Tintri is to offer all-flash storage with the release of the Tintri VMstore T5000 series. Like the others in the portfolio, this is VM-aware storage powered by the same Tintri OS and real time VM-level analytics. While the performance increase over the current hybrid ranges is marginal for most applications there are some, such as large databases where the difference is marked, explains Chuck Dubuque, senior Director of product and solutions marketing at Tintri. “We estimate that around 15% of the customer base will have a use for this,” he says. The price of flash storage, while falling, is still probably around twice that of hybrid alternatives. Tintri also announced a converged infrastructure stack, starting in the US with six partners and moving to Europe. This will offer converged systems, but aims to not lock the user into particular configurations. The ease of configuration and standard set-up which has been a strong sales point for Tintri will continue, he says, with the converged stack. It is working with Cisco UCS, Dell, Brocade and Juniper among those vendors with major European sales. This, and the all-flash, may take it into new levels of competition, he admits. Where once, Tintri would find itself selling against the likes of NetApp, this will take it more into EMC territory.